If your browser doesn’t redirect you to the new location, please visit The Gun Shots at its new location: www.outdoorlife.com/blogs/gun-shots. Good info, wish I could read it. Click on the image and you should see a larger version that is legible. I remember reading about the first tests with this guns prototype and I thought it may be the perfect sidearm for a small town police dept. with its low price and the general dependability of Ruger. Same here. I haven't spent a lot of range time with the SR9 and therefore can't offer a detailed opinion, but with the limited shooting I have done with it I have to say that it appears to be a very workmanlike pistol. It was comfortable, pointed well and seemed as though it would make a fine sidearm for duty or for personal protection. There were a lot of questions at the time of its introduction as to whether the world needs another polymer-framed, striker-fired pistol. And I know that sales of the SR9 in my area haven't been great (this was pre-recall). Can Ruger recover from this to take a decent portion of the market share? I don't think anyone can say at this point. Ruger is trying very hard to make this right, offering free shipping and handling. What about the fee for using an FFL to send the firearm to Ruger. My local FFL holder charges $50.00 for his services. I hope Ruger works it out and the FFL that the purchase was made from absorbs this cost, too. 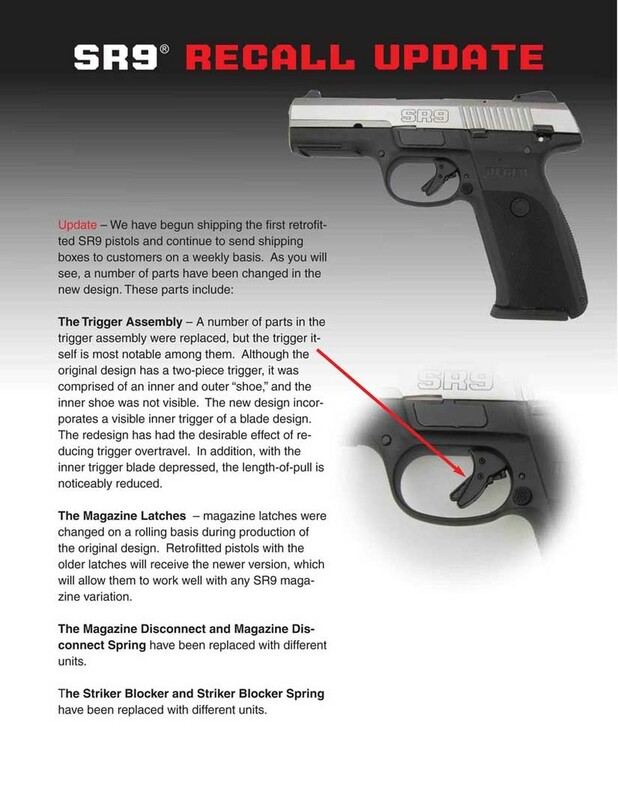 While it's bad to launch a new product (and then have problems with them) at least Ruger is standing behind their pistol. I've owned Rugers for years and I've had a few small problems with the last two I've purchased. One was magazine related and the other was a revolver that had to be rebarreled. Ruger stood behind both products and took care of the problems. I was thinking about buying one of these pistols, but now, with the problems they have had and my recent trouble with Rugers, I will probably wait for a bit to see how it all shakes out. Skip the dealer or FFL holder and take it right to UPS(big brown). They will pack it and ship for less than $30. Since this is a recall Ruger 'may' give you a credit. As far as warranty work on my guns, the American manufacturers have done backflips to please the customers, I'm speaking of S&W and Ruger. BTW, you want customer satisfaction? Try to get it from Glock. JMO. PS. Try to get proper aftermarket parts! IME. I meant to include you in my last post. You stated "Ruger stood behind both products and took care of the problem". Thats all I want sir, not some lady on the phone giving lame excuses. As you can tell from my last post got rid of my only Glock. A M22 which I consider their best of the bunch after 'spring/trigger' fiasco. Never dealt with Sig or HK but I'm sure they got warranty problems too. I should repost, I got rid of it 'because' of bad springs which no shop in this area was authurized to do. Which brings up another rant! Like I said, Ruger has taken care of the problems I've had. I've owned quite a few over the years, it's just been the last two that I've ever had any issues with. That fact, plus the recall on the SR9 does make me a bit hesitant to purchase one at this point. I received my shipping box from Ruger four and one half months after registering for the recall. The gun was returned to me in one week, all repairs complete. I received a free 17 round magazine, a ball cap and some Ruger decals. A letter was enclosed explaining the changes to the gun and a new parts list insert for the owners manual. The gun now has a Glock trigger. I am a Glock armorer so I can tell you that this gun is a Glock clone, no doubt about it. That said; it works very well. I have fired this gun extensively and it is more reliable than many Glocks I have used. Part of the reason is that the springs, especially the recoil spring, is pretty hefty. Glock springs are frequently under spec, even new ones won't push the required seventeen pounds. The Ruger springs are all that! No failures to chamber as often occurs with Glocks. The manual safety is also a feature that many people desired on a Glock. Gaston Glock won't make an ambidextrous magazine release, Ruger did. This gun has many advanced features; I look at it as a perfected Glock. I am satisfied with my purchase and think that Ruger has a very good pistol in the SR-9.